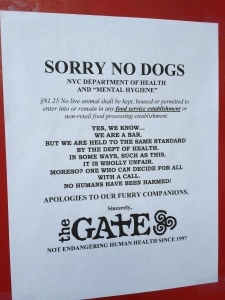 The Gate, one of the most famously dog-friendly bars in New York City, posted a sign Sunday saying that it’s been busted by the Health Department and will no longer allow dogs. Thousands of dogs and dog lovers have been enjoying the outdoor patio of Park Slope’s divey bar for decades with nobody catching rabies or even cooties, but as the sign points out, the outdated law is forcing them to stop the practice. This sad outcome is only possible because New York City has an outdated health code that reflects medieval superstition rather than infectious disease science. Chicago passed a dog-friendly code in 2012 and has since seen no calamity. Restaurants don’t have to allow dogs, but they can if they want to. The whole state of California officially decided in August to allow dogs in outdoor seating. European bars and restaurants have welcomed dogs for centuries and they seem to be doing fine. I happened upon now New York Mayor Bill DeBlasio back when he was a long-shot candidate at the Grand Army Plaza Farmer’s Market in June, 2013, and I asked him about New York allowing dogs at outdoor cafes like Chicago. He said New York is “more dense” so he didn’t know if it would be feasible. Really, Park Slope is more dense than the Loop? Than L.A. or San Francisco? Frankly, I like that the mayor supports getting rid of horse-drawn carriages in Central Park, but this law (along with maybe banning the sale of puppies and stronger spay-neuter rules) would do a lot more to improve the lives of New Yorkers and their animal friends. The Gate points out that it has been “not endangering human health” since 1997. Often it seems like you have to have a dog to sit out on the patio. It’s the whole point of going there. For me and many others, the dog policy is the main attraction. People sit outside on the patio, bring their dog, and the staff, who have always been really nice, even let you bring in food from area restaurants since The Gate doesn’t serve food. Dogs sadly no longer allowed at The Gate in Brooklyn’s Park Slope. 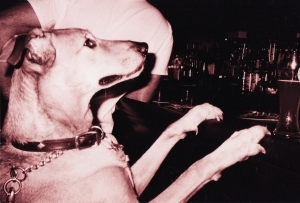 New York dog lovers and their favorite bars have been doing a dance around the law for decades. The Scratcher in the East Village was the favorite bar of dog people for years–until one day someone who didn’t like dogs came in and didn’t like it. Then, instead of going to any other bar in the city that didn’t allow dogs, they called the health department. Other places make you tie the dog outside the fencing–which creates more problems for dogs, their people, and anybody walking by than its worth. There are so many things New York City could do to make restaurants stop spreading illnesses–more hand sanitizer, fewer bathroom doorknobs, maybe some bleach solution on condiment containers and menus. But if I want to have a beer–or even a salad–with a dog at my feet, I should be able to do it in what is America’s most sophisticated city. I’ve lived in NYC for my entire life and have never heard of ANYONE getting sick from a dog in a bar. A couple of years ago I found that horseshoe bar stopped letting dogs in even thought hey don’t even serve or prepare food. The reason? The Health Dept counts ice as FOOD! OMG! Really? If ice is food then in theory I should be able to consume it to prevent starvation. Not the case really, is it? If someone has allergies, I can appreciate that, but honestly, few people are so sensitive as to go into anaphylactic shock from a passing dog. It’s not just about the dogs either. It’s about the PEOPLE. People who own dogs are as much citizens with needs as allergy sufferers or anyone else. Yet they seem to get the back seat every time. Dogs are not unnecessary. They have been our partners for thousands of years. Anthropologists have reason to believe that we were helped in our evolution to Homo Sapiens, in part due to our partnerships with dogs on the hunt, in looking out for predators, etc. We owe dogs so much more than people realize. Yet we think dog friendliness is water bowls and blueberry facials. Dogs need to be WITH us. Behavior problems ensue with too much alone-time, and we have to work our day jobs as it is. Make dogs part of life WITH us again, not just an afterthought.